What is the Gaviotas Marion Institute Carbon Offset Initiative? Clearly, reduction of CO2 and other Green House Gas emissions is critical and must be central in any effort to deal with global warming. This is true for our program as well. It is also painfully clear that few Americans would be able or willing to lead a low carbon life style. Every aspect of our economy is dependent on fossil fuels. This is the current reality, and will most likely remain this way for the foreseeable future in spite of every well intentioned effort to change things. The Gaviotas project began nearly thirty years ago, before the first alarms were being sounded about carbon emissions, global warming and the resulting climate change. Paolo Lugari began this project as his life’s work in an effort to address the fact that 52% of the population of his country live in poverty. 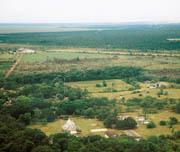 The project leader was deeded 12,000 hectares of the least desirable and most problematic land in the country to mount his experiment, saying, “If it can be done here, it can be done anywhere.” The reestablishment of a fully canopied, poly-culture tropical rain forest on 8,000 of the 12,000 original hectares is a measure of success that was heretofore unheard of. The fact that 200 people now call Las Gaviotas home, and live sustainable, industrious lives in concert with their environment is an example for us all. An additional 3,000 people from the wider region have found periodic work at Las Gaviotas. Why offset your carbon emissions with carbon offsets from Las Gaviotas? The eco-village known as Las Gaviotas is a research center located in eastern Colombia, South America. It is the only project in the world with a twenty-three year track record of the sustainable regeneration of tropical rain forest. As of this year, Las Gaviotas will have successfully reforested 8,000 hectares (20,000 acres) of fully canopied, poly-culture rain forest. 10% increase in annual rainfall. Dramatically decreased surface soil temperatures. Sustainable living wage economy for indigenous population. Development and use of alternative sources of energy. Proliferation of plant species, 253 at last count and rising. Sustainable sources of lumber, resin, cashew and bio-fuels. 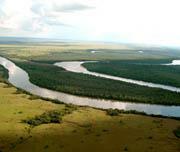 Sensible and sustainable management of natural resources. A model for sustainable third world rural development. As a result of this success, Las Gaviotas has 144,000 tons of carbon offsets to offer on an annual basis. This tonnage of annual carbon sequestration is calculated using formulas developed in response to the Kyoto Treaty on Global Warming known as the Kyoto Protocol. 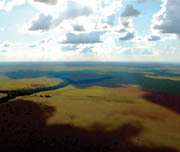 The 8,000 hectares of existing maturing tropical rain forest is the source for this annual tonnage of carbon offsets. How do I offset my carbon emissions with offsets from Las Gaviotas? The first step is to calculate your carbon. You may also offset the average American annual carbon footprint of 21 tons. Carbon is Nature’s building block. Everything that grows is built out of carbon. Carbon is also stored in great quantities in all fossil fuels. When carbon is in its solid form, as in a tree trunk or a vein of coal in the ground, it is harmless, and in fact profoundly helpful and supportive of life as we know it. When these sources of carbon are burned, carbon is transformed into a gas known as Carbon Dioxide or C02. Increasing accumulations of C02 in the earth’s atmosphere coupled with increasing emissions of other green house gases is responsible for the global warming crisis we now face as a global community. The term “carbon footprint” refers to the amount of carbon (C02) we emit individually in any one-year period. C02 is produced from many sources and is the primary gas responsible for Global warming and the resulting alarming changes in our climate. Nearly everything we do in our modern society requires energy. This energy is generated primarily by burning fossil fuels. From all sources, the average American is responsible for approximately 19-21 tons of carbon emissions annually. The US as a whole is responsible for emitting approximately 25% of all global green house gas emissions every year while we are only 5% of the world’s population. Why offset one’s carbon footprint? It is important for us all to think in terms of first reducing our emissions of C02. As one begins this process, it soon becomes evident that there is no way we can currently reduce our emissions of green house gases to zero. Every single aspect of our economy from manufacturing to transportation, and agriculture to health care is dependent on fossil fuel derived energy and resources. As we seek and develop alternative sources of energy, and as we begin to think and live in more efficient ways, we are still left with the undeniable reality that considerable C02 emissions from economic activity in the US will continue and perhaps escalate for the foreseeable future. The only current way to address this issue head on is to offset the emissions we cannot yet eliminate.